My name is Kimberley Primmer; I am 16 and will be representing Clacton this year as Carnival Queen with help from my two beautiful Princesses Megan and Jenita. I am in my first year of Sixth Form currently studying IT, History and Law at Clacton Coastal Academy. Outside of school, I volunteer at a local Primary School Nursery as I would like to become a teacher when I am older. I also enjoy reading and spending time with my friends. The thing I am most looking forward to is meeting the other carnival courts and representing Clacton. And not forgetting spending time with my Princesses Megan and Jenita. I met them on selection night, and found out that we all go to the same school! They are so lovely and I can’t wait to get to know them better and spend my summer with these girls. I would firstly like to thank the judges for picking my princesses and myself (even though I was the only queen that entered) to form the new Carnival Court for 2013 and also the committee, who many have known me since I was born. 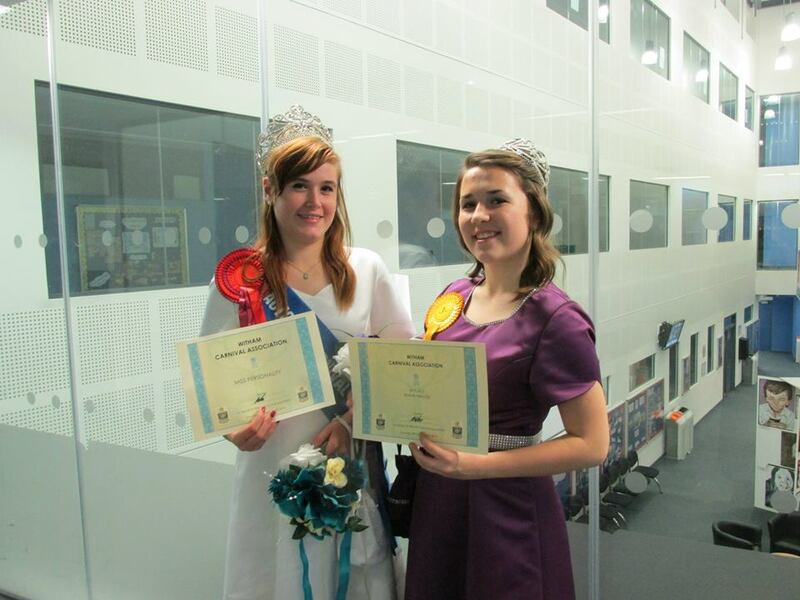 Well done to Emma, Kerry-Alice and Zoe for doing such a great job last year as the 2012 Carnival Court. Come and see Megan, Jenita and I this summer, selling raffle tickets and visiting other carnivals. More importantly come see us during Clacton Carnival week, when we will celebrating 60 years of an amazing week. Today Jenita, Megan and I went to see our dresses for the first time at Beautiful Brides. 3 weeks since first going to get measured and pick the dress style, it was amazing to see how fast our dresses were transformed from just a roll of material to a beautiful dress. Even though, they are not completely finished, the dresses look amazing so far, and I cannot wait to see them when they are done! You will be able to see our dresses for the first time at Little Clacton Carnival on the 8th June. It has been just under a month since Jenita, Megan and I had been crowned, and we were very excited to be taking part in our first function at Witham Selection Night on the 20th April. I was excited all week leading up to the event, but on the day, the nerves were kicking in, but I was still looking forward to a really great night! When Debbie had picked us all up and we were all on our way to Witham, she told us that there was going to be a competition where we had to present ourselves to the judges by saying a little bit about ourselves and then finishing it off with a curtsey. We decided to do it as even though we were the only court without our dresses, it would be a great experience and we had nothing to lose. When we arrived at the Maltings Academy, we were shown to our seats by Witham’s beautiful Carnival princesses Lauren and Mia, and then me and the girls went and practised our curtseys, and ran through what we were going to say. Debbie then took a few photos of us, and we went back to our seats. When the disco started, Jenita, Megan and myself thought that this was a perfect opportunity to go and meet some new people from the other visiting courts, and also show them a few of our moves . There were many entrants for Princess and Queen and it was hard to guess who would win as the standard was so high. After the entrants for Princess and Queen had talked to the judges, it was time to dance a little bit more and then get ready for the competition. As we were lining up outside waiting for our turn we listened to the other courts presenting themselves and also we talked to some of the other courts. Next it was our turn; we walked up with big smiles on and talked about ourselves, and made the judges laugh, which was good, we then did our curtsey, and everything went down well. Even though we were nervous, we did a good job. Unfortunately e didn’t win anything, but we didn’t mind, the most important thing was that we had fun doing it. Next up it was time to announce the new Witham court. We then went and congratulated the new court, and had a big group photo with the other visiting courts. It was then time to say goodbye to everyone and make our way back home. I would like to thank Debbie and my Mum for being our chaperones and taking us to Witham, and also Jenita’s mum, and Megan’s Mum and Nan for joining us on our first outing as court. Not forgetting Witham Carnival for inviting us. Our first function went really well and I enjoyed every moment of it. I can’t wait for the many other events we are attending. A big well done to Queen Alice and her Princesses Courtney and Millie, I hope you all have a lot of fun over the next year! 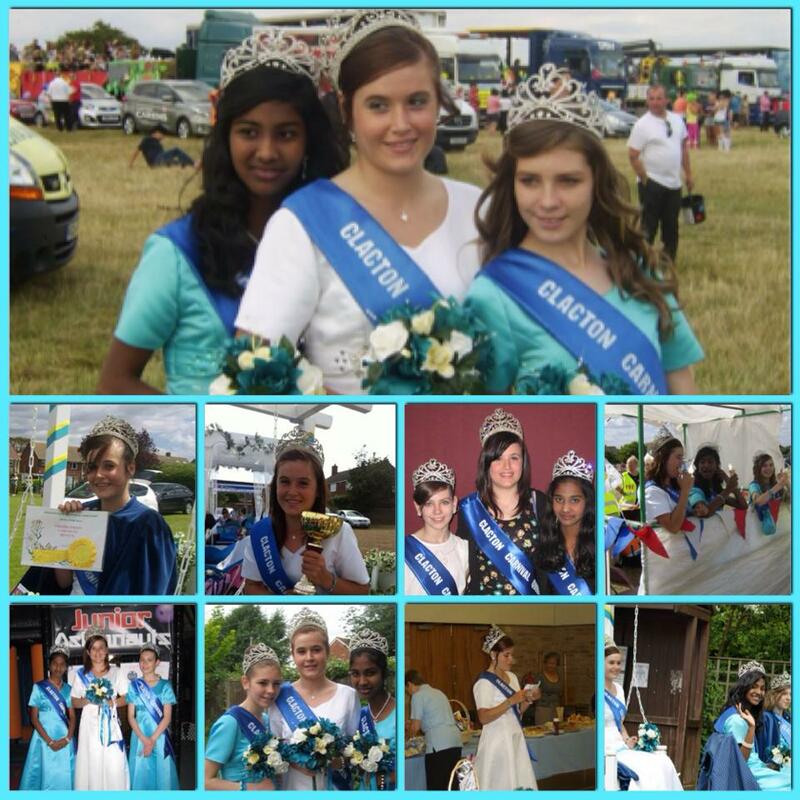 Today was the day of the Clacton Carnival Court 2013 first carnival of the year, and as Queen I was very excited! All day I had wanted to put my beautiful dress on, and it was great to finally get the chance to do so, as it was the first outing with them on. On the way to the carnival, Jenita, Megan and I were so excited about our first carnival procession, and were looking forward to seeing the float and its new design. When we arrived we saw the float and it was fanatic! Big thanks to Debbie and Dave for making the float. We had our photos taken for the gazette and the carnival website. While we were waiting we sat on our float, and had more photos taken. When it was time to start the procession and we moved off, it was great to see how many people and familiar faces there were lining to street to watch the procession. A lot of children gave us big waves and smiles, and we did the same back, and one girl shouted ‘Look mummy, it’s the Queen’ and that really made me smile! When the procession finished and we arrived at the fete at the village hall, we went for a walk around the fete and met up with our families, and there were more photo opportunities. Debbie brought us all a cake, and I had one with sparkles on. (It tasted REALLY nice). We watched a few of the dancers and then decided that it was time to head back home. I enjoyed going to Little Clacton Carnival so much! It was great to finally have the chance to do something that I’ve wanted to do since I was a little girl. And the only thing I have left to say is, bring on the rest of the summer. Tonight my princesses and I attended the poster competition presentation at Space Kingdom to hand out the prizes to all of the winners. It was raining outside at the start of the evening so I was glad that we would be inside for the event. We arrived and the first thing we did was looking at all the winning posters. They were all fantastic but my favourite one was the one with the lion king. We then went to have our photo taken in front of the equipment, which looked so fun and went to get a drink. Before the children arrived, my princesses and I had a quick game of air hockey and both me and Jenita drew with Megan 2-2. It was such a laugh! Buzz the Space Bee who is Space Kingdom’s mascot arrived and we had a few photos taken with him before we had to start handing out the prizes. When it came to the presentation we handed out the rosettes and certificates to the winners and had our photos taken with them as we handed them the prizes. Paul also made them point out which poster was theirs. After all the prizes were handed out the winners were allowed onto the play equipment. During this we were asked by some parents to have more photos taken and I even got asked to be part of a schools diary where students take a bear, or in this case, a rhino home and tell a story of where they have been, which was great! At the end of the evening we sat down for a bit with some committee members and had a chat, and then decided that it was time to head home. We had a really great evening, and I can’t wait to go out again for Brightlingsea Carnival this Saturday!! On the 15th June my princesses and myself attended Brightlingsea Carnival. As Debbie picked us all up, we talked about the three prize categories that we could win in; Queen of Queens, Princess Pairs and float. I was very excited for this as it was our first carnival with other courts and our first one being judged! When we arrived our float was already there along with some other queens. Brightingsea’s carnival court came up and greeted us, and told us about the day ahead. She also mentioned the fact that the weather was holding up, even though it was windy. We then went to talk to the other courts such as Witham, Walton and Dunmow. Everyone there was so lovely! We had a few photos taken even though it was very windy, but we managed to get a few decent ones. After a bit more gossiping with the other courts it was time for judging. The judges came round and I was very nervous. They asked me about the dresses and how they liked the colour, and they also asked about our very first carnival at Little Clacton last week. They seemed happy which was a good sign. We sat on the float a bit longer waiting for the judges to finish looking at the floats and talking to the courts, and then finally making their decision. After about 10 minutes, the judges came up to me and told me that had something to give to me. I HAD COME THIRD FOR QUEEN OF QUEENS! I was so happy, and I even went bright red and speechless! I thanked them and they went off to hand out the rest of the prizes. We waited a bit to see if we had won any other prizes, which we didn’t, but at least we had won one. 1 o’clock arrived quickly and it was time to move off for the procession. The procession route was full of people waving and smiling and the weather held off until we arrived at the end of the procession. As the courts arrived in the arena we were introduced and then lined up. Even though it was raining, we still had smiles on our faces. After having a group photo, we made our way into the Queens teas at the bowls club. It was our first Queens teas and it was delicious. After we had all ate, Brightlingsea’s queen made a speech and we all said thank you. After talking a bit longer we said goodbye and made our way back home because it was raining heavily. Despite the rain, we had a great day at Brightlingsea. I can’t wait to see everyone again at Great Bentley Carnival. The weather on the morning of Great Bentley Carnival was amazing! It was so sunny, so it looked like it was going to be a good day. As Debbie and Nicky picked us up, we got told that we were being Judged for Float and Queen of Queens today, and I really hoped that we would win something. We arrived and started talking to the Witham Carnival Court, it was their last carnival with us which was sad, because we were all good friends. We then had some photos taken and went over to talk to the Brighlingsea Court. We were then greeted by the Great Bentley Queen who said that we could go into the hall and have a drink and a rest before judging. This was a perfect time to gossip with our new friends who we hadn’t seen for 2 weeks. We then went back out and got ready for Judging. the Judges walked round and asked me about our float. We then waited a little bit longer, to see if we had won anything. The judges came over and handed me a rosette for 3rd place in the Float competition. Jenita, Megan and I were so happy! It quickly became time for the carnival to begin and along the route we saw many happy faces waving and saying how great we all looked. The streets were very busy around the village green where the fairground was, which was probably because it was so hot. At the end of the procession, we were introduced into the arena, and made our way up onto the lorry which was the stage. We sat down clapping all the other courts, and then it was time for the winners of all the other categories to be announced. The amount of hard work that had gone into creating the floats was fantastic. After all the trophies were given out, we got off the stage and we were allowed to look round the stalls. We were looking around are realised how hot it was. So we went to sit down near the drinks tent. After a little sit down, we were allowed to go into the tent where queen’s tea was placed. The food was amazing and the strawberries were delicious, they were by far the best strawberries I have ever tasted. We then said our thank yous and made our way outside for a group photo. After this we said goodbye and then made our way home as it was very hot. It was the hottest day of the year so far, and we were heading for Witham Carnival. The last time we were here, it was our very first function as carnival court. We arrived and then went over to talk to the retiring Witham Court and the new court. We hadn’t seen each other for a while so we all stood around chatting and had a laugh, followed by a few photos. We then went a stood in the shade, as the heat was getting unbearable. After talking to the other courts for a little bit, we when and sat on the float, had lunch and then got ready for judging. Unfortunately, we didn’t win anything this time, but there was a lot of courts, and the girls that won deserved it. After judging, we had one big group photo, and then got ready to start the procession. There were a lot of people out watching which was great!! After the procession, we got walked through this little shopping bit in Witham, and then through the fete to the arena. We got introduced one by one, and then stood at the back of the arena watching the winners of the majorette troops be announced. After this Withams Queen Alice done a speech and announced the fete open and we then listened to the national anthem, we then went to the middle of the arena as this one brave woman was about to get her hair shaved for charity. We then went off to the Queens Teas. It was my birthday the Wednesday before the day of the carnival, and I was given a card signed by all the different courts. It was amazing!! We then ate, made our speeches and then said goodbye. Even though it was a long day, I enjoyed every moment of it. It’s exciting to know that its Clacton Carnival next!!! It was the morning of the Clacton Carnival Street Procession and I was a bit nervous, however I was very excited. I was about to get my makeup done when I had had a message from Dream 100 radio asking me if I wanted to be live on air! I said yes, but I was scared to be talking to thousands of people just in case it went wrong, luckily it didn’t! After I had my makeup done by Ultraviolet and my hair done by Spikes, I had a bit of time to relax and read over my speech for Queens’ tea. After an hour or so, I put my dress on and got ready to get picked up for the procession. At the field, I went to greet the other Queens courts that were attending. The visiting courts were Walton, Hornsey, Great Dunmow, Burnham, Witham, Maldon, Basildon and Pitsea and Coggeshall. It had been a while since we had attended any carnivals so it was great to see them all again. Mega, Jenita and I walked round the field looking at all the floats and then we got ready for judging. We waited for all the winners to come over so that we could hand out the trophies. After this was done, we sat on our float ready for the Procession to begin. Going through Clacton and along the seafront was amazing! There were so many people out watching the procession and it was the busiest carnival in years, the atmosphere was amazing! I have wanted to be Carnival Queen since I can remember, so leading the procession was the best day ever! After the procession had ended, we went to Queens Teas. We greeted the other courts as they arrived, and then we all sat down. It was time for my speech, and this was the thing that I was most nervous about, luckily it went great! We then ate our lovely tea made by the Inner Wheel ladies, and the other courts then stood up to say their thank you speeches, Brighlingsea’s Queen even said that this was the best carnival she had been too! We then said goodbye to each other and headed home. After looking around the classic cars (and selling a few tickets as we went) the man at the NYPD police car asked us to have our photo taken, but before this, he showed us pictures of previous Queens next to his car. After a few pictures, I headed to the arena to watch the Cheerleading group that I used to be part of a couple of years ago, they were fantastic as always! 2012 Carnival Queen Emma was at the fun day and we decided to go watch the Wild West Show as it was the last thing of the day. Before the event, myself, Debbie and my dad went to show our support at the Only Cowards Carry shop opening which was a great as it was amazing to see so many people come together to support a great cause. After this I went up the carnival to help with the last minute things that needed doing before the event started. Apparently I’m the first Queen to help set up the field for anything, which was great to hear! During the event, we sat in the arena, and started off the races. It was so much fun to watch the races up close! After each race we handed out the rosettes and prizes to the winners. Before the final race, there was a dad’s race which was so funny to watch! Dads lined up at the start with hobby horses and then ran around the arena and a couple of them fell over haha! It was definitely the highlight of the evening. I then started the final race of the evening all the jockeys looked as if they were having a great time. I then handed out the prize to the winner of the 2013 donkey derby and it was time to set off home as the event was over, and relax before the bowling tournament at the Pavilion Bowl tomorrow! I love bowling and it is one of the only sports that I am good at, so I was gutted that I couldn’t bowl as I was in my dress and crown, however I had fun either way. When we arrived we were given the job of selling raffle tickets to the bowling teams that were taking part. It was great to see a lot of people joining in on the fun. After selling raffle tickets, we went and watched some of the teams bowl, all the teams were great and I knew that it was going to be a close competition. After everyone had bowled, it was time to draw the raffle. There were a lot of prizes, which was good as we sold a lot of raffle tickets to people. After this, we then gave out the trophy to the winning team. They were so happy that they won, and it was great to see the smile on everyone’s faces! Making people smile has been the best part of the Queen experience!! After setting up the beach for the event, Jenita and Megan arrived and we started putting the wristbands onto the contestants just so we know that they were taking part in the event. There were so many children taking part, and it was great to see them all having fun doing it. When the competition started, I sat at the edge of beach watching the children make the sandcastles and the fun they were having. They all looked great!! As the Carnival Court, we got to judge the competition. Jenita and Megan judged the pairs and the 10 to 14’s and Alan Wiggins who is the Ex-Chairman of Carnival, daughter, Linda and myself judged the under 6’s and the 7-9’s. The decision was hard as a lot of effort had gone into all of the designs and all children had fun making them. After we had made our decision, it was time for the hula hoop competition I also had the job of judging this which was fun but hard as there was a lot of children that were very good! I had to choose 2 from each round for the final, and the final decision was not easy at all! After the winner was announced, it was time to say the results of the winning sand castles. We handed out medals to the winners and then had our photos done. After this it was time to head home and relax before the events in the evening. Next it was time for the beer dig. Tokens are hidden in the sand ready for children and adults to come and dig through the sand and find, to win a drink. There is one special prize hidden in the sand, for a bigger prize. A lot of the tokens were found really fast including the special prize one. It was great to see so many people come to take part, as this meant we were raising a lot of money for many great causes. It was getting later in the evening, and the majority of the tokens were found, which meant it was time to head home, and rest before the last field event tomorrow. This has always been my favourite carnival event as I know how much hard work goes into it, as my mum organises it. I normally head up the field bright and early to help set up the many sideshows, but this was different this year as it was my A-Level results day. But I can assure you that I didn’t miss out any of the hard work which I enjoy helping with, because straight after I got home, I headed up the field to join in, before I had to head home and get ready. It was the last day of Clacton Carnival 2013, which was pretty sad as the week had gone too quick for my liking. Luckily it was a 1pm start today, which was nice as I could relax after the late night before. Our job of the day was to sell raffle tickets to the parents of the children entering the competition. Once this had been done and everyone had arrived, we paraded the children around the hall, to show off their costumes to the judges. One of the judges was the 2012 Carnival Queen Emma, so it was great to see her again J a lot of effort had gone into the costumes, so it must have not been an easy job for the judges to pick a winner. There were a lot of entrants for the Theme ‘Musicals’ category, which was great to see the children get into the carnival spirit! It was then snack and refreshment time, and time to draw the raffle. Once this was done, it was time to announce the winners, and give out the prizes. I would like to say a big well done to the winners and everyone that took part. This was the last event of Clacton Carnival 2013, and what a great way to finish! I was looking forward to the event although I was very tired! When we arrived, we went and sold raffle tickets for the last time. This was a good feeling believe it or not, but I had enjoyed raising even more money for carnival J once all the teams had sat down, it was time for the quiz to start. Our main job was acting as runners, and collecting the answer papers and any jokers that the teams were entering. Jenita, Megan and myself even had a go ourselves, and got some of the questions right, which we were very happy about. There was one round where the people taking part had to interact, this could be singing or dancing or anything else to do with the question. One of the tracks played was ‘dancing queen’ so the carnival chairman Paul got up and started dancing with me. It was so funny, and I was literally crying with laughter! Paul won a box of chocolates for taking part, and as I turned to sit back down, he got down on one knee and handed them to me. I literally went bright red! After the quiz, it was time for the presentations. I presented Debbie and Nicky some flowers for helping Jenita, Megan and Myself with this great experience. After this was done, Jenita and Megan were handed their prize money. When it was my turn, Paul said that I had made carnival history by being the first ever Carnival Queen to help move equipment for HQ to the field and set up for the carnival events. We then handed out the prizes to the winning teams, and the team that came first were the ‘beautiful brainiacs’ from Beautiful Brides who made our lovely dresses. The quiz night was a brilliant end, to an brilliant week. It was the day after the last day of Clacton Carnival 2013, and there was no resting for Jenita, Megan or myself as we had to be up early for our last ever carnival. We arrived in Walton and it was freezing, windy, but luckily, it wasn’t raining. We sat around for a bit, and talked to the Brightlingsea court who were parked up next to us, and we waited to be judged. Once the judging was over, it was a long wait to see who had won, but the wait was worth it as I had one Queen of Queens!! I was so happy, and it is one moment that I will never forget about this experience. During the procession it was really windy along the seafront, but it stayed dry luckily. For Queens Tea’s we went to the Naze Marine Holiday park. On all the tables, there were little bowls of sweets, which was really nice, as well as the wonderful buffet. After we had eaten, it was time to say our thank you’s and goodbye to everyone, and head home. It was a great day to finish our last carnival, which has made the whole experience of being Carnival Queen even more special. I would like to thank Debbie for taking us to all the different carnival that we have attended and also our other chaperones Nicky and my mum. Another thank you goes to Debbie, for towing our float around the different carnivals. Tonight was the night that all the local charities and organisations were receiving cheques for all their hard work and support carnival week. Jenita and Megan were busy so it was only me attending. As people came through the door, I greeted them and showed them to the hall where the presentation was taking place. After everyone had arrived, it was time to make our way to the hall and for the presentation to start. My job was to hand out the cheques to the people coming as a representative of the charities who are receiving the donations. A grand total of £11,329,50 was given to more than 43 local charities and organisations from the money raised at Carnival Week. In May, I went to a Carnival meeting, and the committee were asked what their favourite part of carnival was, the majority of the committee said that their favourite part, was giving out the money to the different organisations and charities. And it really was great to see so many people come and collect the money that they help raise. One of the best parts of being Carnival Queen is going to the different towns and seeing the other Carnival Courts. We were invited to Witham Carnival’s presentation evening and dance. When we arrived we started talking to the other courts straight away, as we hadn’t seen each other for a long while. When everyone had arrived, we had a quick dance, and then the presentations were handed out to the winners of their Carnival, such as best float, and Queen and Queen, and donations were given out to organisations in Witham. We then started dancing again, before it was time for the Princesses competition. Jenita and Megan went with the other princesses to get ready, whilst the Carnival Queens sat down and watched. When it was Jenita and Megan’s turn, they came out separately and both did brilliantly! Unfortunately, they didn’t win anything however; they both did a great job and did us all proud. Before we went home, we got a group photo, did a bit more dancing (we did a lot of dancing!) and said goodbye and went home, which was sad as this was the list time we were going to see some of the amazing friends that we had met on this experience. 2013 has been a great year. Not only just for me, but for Clacton Carnival as we celebrated 60 years of the fantastic Association that we have today. I have helped with Carnival ever since I can remember and I've wanted to be Carnival Queen, so getting the opportunity to do something that I've always wanted to do, has been amazing. Back in March when I entered for Carnival Queen I was so nervous, but I'm so glad I did it as it has been the best experience ever. There has been many great parts such as visiting other carnivals, meeting all the other Carnival courts and the people involved and also representing the town where I have lived all my life. The highlight of it all has to be the Clacton Carnival Procession as seeing all the local people and people from other places come and support Carnival and the local charities was amazing and I can't thank you all enough. And getting to lead the carnival procession was probably the best feeling ever. I won't forget any moments from my time as Carnival Queen, especially when I won Queen of Queens at Walton Carnival, and also giving out over eleven thousand pounds to many local charities for all their hard work supporting Carnival this year. Which many are giving up their time today, and using the money raised, to give Christmas meals to the elderly and less fortunate. On behalf of my princess`s Clacton Carnival Committee and Myself we hope that you all have a very Merry Christmas, and a very happy 2014. This was the last time we would be out visiting other towns, and the last time we would be out as carnival court. Jenita was busy, so it was only Megan and myself attending, but we still had fun J We arrived and were greeted by the 2013 Basildon court, and went and took our seats. After a while, we went up and danced with the visiting courts, and then sat down to hear the retiring court speeches. After this was done, each court was given a different raffle ticket colour, and we went and sold them to the people who had come this evening. After a bit more dancing, it was time to crown the new court. They all looked stunning in their dresses, and I hope they have a fantastic year. Saying goodbye was sad as this was the last time we would be seeing these wonderful girls. I wouldn’t of had the most amazing year ever if it wasn’t for the lifelong friends that I met along the way. As my time as Carnival Queen is over I would just like to say what an amazing year I’ve had. I’ve wanted to be Carnival Queen since I can remember and as I grew up with carnival, I can finally say what an honour it has been. As much as I do not want to give up my crown I would like to say to anyone who wants to be a carnival queen and princess to go for it; it will be the best experience you will ever have. Thank you to everyone who has supported Clacton Carnival this year, without you all we wouldn’t of raised over eleven thousand pounds for well-deserved charities. I would also like to say thank you to all the committee, especially Debbie, as without her, we wouldn’t have gone to all the wonderful places we have had the pleasure of visiting this year. Most importantly, I would like to say thank you to Jenita and Megan. You have made my year fantastic and I am so glad that I got you two as my carnival princesses. All the memories that we have shared will always be special, and I hope you go on to become Carnival Queens as I know you will be fantastic. Hi, and welcome back to my queen diary page!! As you may all be aware, I gave up my crown on selection night in March to the 2014 Carnival Queen, Chyanne. Unfortunately, Chyanne now lives in Liverpool where she is at university. After being asked by the committee, I have agreed to step in as Deputy Carnival Queen for the rest of the year. I am very happy to have the crown back, and am looking forward to spending the rest of the year with Teegan and Mia!! My first official function as Deputy Carnival Queen was presentation night where we hand out the monies to the charities that helped us throughout the week despite the very wet and windy weather that we had. Teegan, Mia and I greeted people at the door as they went and took their seats. Our main job of the evening was to hand out the donations to the charities and organisations, which call game to the grand total of £7432. At the committee meeting that I attended in April, the committee members were asked what their favourite part of carnival week was, and this event was mentioned by most members. You can definitely see why, as it is a privilege to see so many well deserving charities and organisations come to collect their donations and see how it can help them and the community. I was very excited to attend Witham Carnival presentation evening as I hadn’t seen some of the great friends that I had made during this experience for a while. Unfortunately Princess Mia wasn’t well, so she couldn’t attend but Teegan and I had a great evening never the less. When we arrived we walked to the hall where we were greeted by the 2014 Witham Carnival court and also Millie and Alice from the 2013 court, who I was very happy to see as I spent most of my reign with them! As the other courts arrived we greeted each other and went and sat down so that the presentations could begin. The Witham Carnival Court handed out the trophies that people had one on their carnival day, which was followed by the cheque presentations to the charities and organisations. It is always so nice seeing charities and organisations receiving well deserved donations, as these really do go to help a lot of people! After this we all got up and danced, and we didn’t stop dancing until it was time for the princess competition. Teegan was entering in this and was quite nervous, however when it was her turn to talk, she did brilliantly and she did so well, she came 3rd place in the senior princess competition!! I was very proud of her as she really deserved it. All court members were getting judged tonight in the Miss Personality competition, there were so many of us! I was so shocked to find out that I had won!!! All I could hear was Amy screaming when I went to collect my prize. I was a fantastic feeling!! After this we waited to see if we had won anything on the raffle, did more dancing and then we said our goodbyes and headed home.